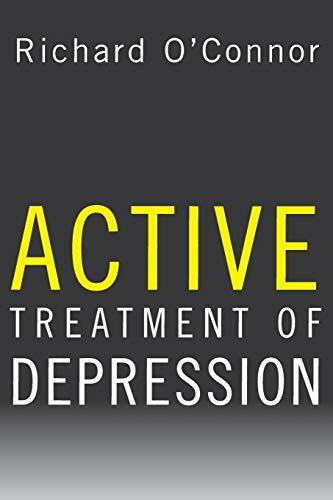 Review of "Active Treatment of Depression"
Richard O'Connor is back to tell it like it is about depression, this time writing an eye-opening, engaging volume for the professional. In this follow-up to Undoing Depression, O'Connor offers professionals advice in ushering their clients to overcoming this debilitating disorder, as well as thoughtful commentary, research explanations, and illustrative case studies. This in-depth guide not only helps a clinician become more effective with their clients, but also encourages them to be more real with them. It helps the client and the clinician take an active role in determining their own destiny in dealing with this disorder. Often moving with personal insights and vignettes, O'Connor provides clinicians the opportunity to enrich their skills in dealing with people who are depressed and provides realistic hope in the treatment and recovery from depression. The book contains 14 chapters which takes the reader through a detailed journey of depression -- its definition, a discussion of its causes, the symptoms and how depression expresses itself in a person's life, biopsychosocial assessment, engaging the client's emotions, using both medications and your own energy wisely, maintaining a therapeutic focus, making changes in the client's relationships with others, practicing change, and how to best deal with termination. Some of these chapters may seem repetitive or basic to most clinicians, however they can be readily skipped without losing anything. For example, if a clinician isn't interested in a detailed discussion into the theories behind the possible causes of depression, Chapter 2 can be omitted from reading. The author is careful to back up assertions with an extensive research bibliography and a detailed discussion of studies related to the assertion. If there's any downside to the book, it may be this issue, as the research discussions sometimes get too bogged down in quoting specific statistics that will be of little interest to most front-line clinicians. I found the author's use of research to be balanced and appropriate overall, however, unlike other contemporary authors which quote only studies that support their hypotheses. Would a non-professional benefit from this book? The answer depends on the person's interest in depression and their educational background. It's a fairly academic book, sometimes dry, and certainly in-depth. It can be appropriate reading for anyone interested in this topic, as long as they're committed to learning all they can about depression. But it is not as consumer-friendly as other books on the market, since that is not its focus.